A wonderful trip to Bandipur – what a great way to celebrate Christmas and New Year. We, the Catch Themes family, went on a celebration trip to Bandipur for Christmas 2017 and New Year 2018. It is such a wonderful place that one should visit at least once in their lifetime. It was an exciting and venturous journey for us. One of Nepal’s most charming towns, Bandipur is a living museum of Newari culture, a beautifully preserved village crowning a lofty ridge, its main street lined with traditional row houses. Bandipur, with its attractive 18th-century architecture, pedestrian zone, and outdoor dining, it has a distinctly wonderful feel. Traveling is fun and the fun doubles when you have amazing people to travel with. We were all set and excited for our one-day celebration trip to Bandipur. Our journey had begun with all us sharing our excitements of the trip and how amazing it felt to catch a break from our daily routines. 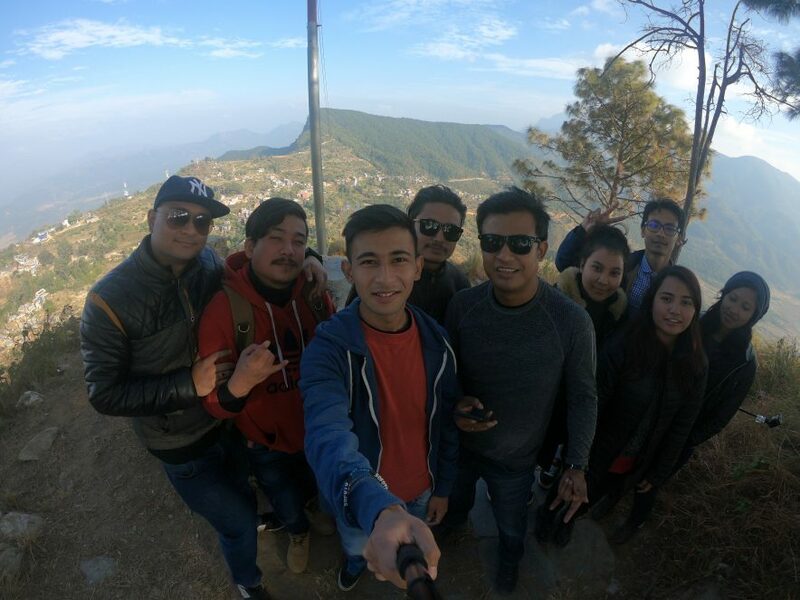 We all decided to go to Bandipur on 23rd of December and return on the 24th. On 23rd of December, we all packed our bags and left for Bandipur. There were a total of nine people on our trip, out of which four started their journey on their bikes, and the rest of the team members on a car. As we were traveling separately, we all left our houses at around 6 A.M. in the morning and decided to meet at the Hamlet Restaurant in Dhading for breakfast. We all reached there at around 9 A.M. and had our breakfast. After that, we all left the restaurant together for Bandipur. We reached Bandipur at 1 P.M. We checked in to Hill’s Heaven Hotel. It was a small but cozy place. We stayed in our rooms for a while and had our lunch later. After lunch, we headed outside to take a stroll in the beautiful village of Bandipur. For our visit, we went to Thani Mai Temple. For spectacular sunrise views, people climb up to Thani Mai Temple from Gurungche Hill. As we climbed the hill, we were all tired. We headed to the hotel for a much-needed rest. After a while, we headed out again and this time we went to a place called Tudikhel. It was a beautiful place. Time seemed to have stood still there, while we visited the place. For our next destination, we went to a religious spot, Khadga Devi Temple. It is a well-known Hindu temple of Bandipur. After a while, we headed to visit a place called Tin Dhara. When we reached there, we saw there were around 5 dharas (stone taps) out of which only 4 had running water. We then took a group snap at that place. We reached our hotel at around 5 to 5:30 P.M. We had some light snacks and gossiped for a while. At around 8 P.M. we went downstairs to order ourselves dinner. After we finished our dinner, we all went to sleep. Next day, we packed our stuff and had breakfast at around 8 A.M. We checked out from the hotel at around 9 A.M. We didn’t stop until the next 100 km when we finally stopped at the Hamlet Restaurant. We had our lunch there and we were on our way again. We, then, went our separate ways towards our respective homes. We all made many beautiful memories in a beautiful place. Finally, we, the Catch Themes family wish you all a belated Merry Christmas and a blessed New Year 2018!